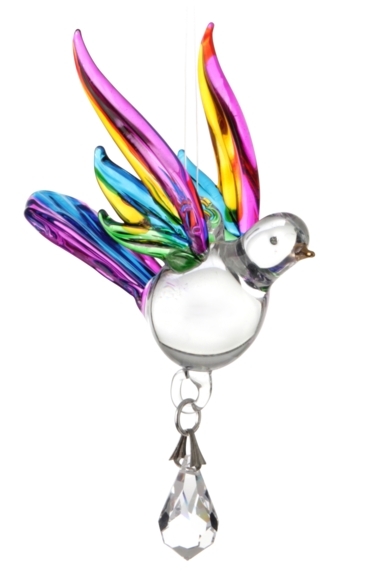 A hand blown, hand painted Fantasy Glass Songbird. Painted in vibrant Tropical colours, with a 24 carat gold hand painted bill and a Swarovski crystal drop. Each songbird comes individually packaged in an illustrated and recycled cardboard box. Songbirds of the same species may have different dialects depending on their geographical area, much the same as people who speak the same language who have accents depending on where they were raised. The robin is one of the few UK birds to sing all year round. It's one of the earliest birds to start the dawn chorus and one of the last to stop singing at night - it can easily be triggered into full song in the middle of the night.